Former Loblaws, 232 main St. S. in Newmarket, Ontario, originally uploaded by BigAssSuperBlog. My mom used to take us grocery shopping here in the late 1970s. Loblaws later opened a much bigger store at "the new plaza" on the southeast corner of Yonge & Davis. 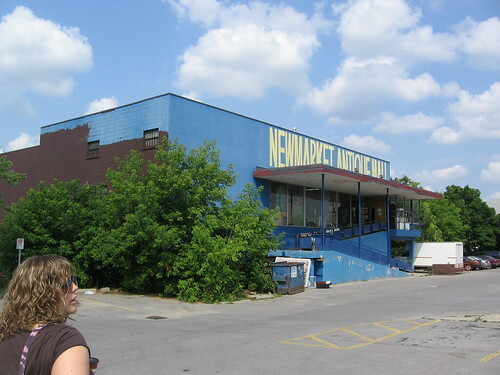 This became the Newmarket Antique mall, which is worth a visit just to see the inside of the former Loblaws store. The whole outside of the building used to be brown. You can see the ramps which facilitated getting shopping carts up and down to and from the parking lot.